As a Level One word, a post is a pole or large stick of wood, used to fasten or attach things to. 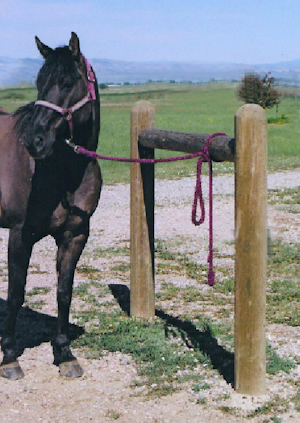 In this picture, the horse is tied to a hitching post. The word is very old in English–it comes through Old French from Latin postis. To postdate a check means to write a bank check and put a date on it that is a little later than the day you write it. The postdated check only becomes valid for exchange on the date you write. Example: Do you mind if I postdate this check? I don’t have money enough to cover it right now, but I will get paid in three days and then you can take it to the bank. Posterity means those who come after us: our children, our grandchildren, and all the rest of our descendants. Example: The paintings and sculptures preserved in the Art Museum are being safeguarded for posterity. Postgraduate refers to studies taking place after graduation from college or university, i.e., studies for a master’s or PhD degree. I did my postgraduate work in China after I graduated in Germany. Posthumous (pronounced PAHS tyu mus) is an adjective that refers to an event that occurs after someone’s death. For example, a posthumous child is a child that is born after the father’s death. A posthumous award is an award given to someone after his or her death. To postpone simply means to put something to a later date in time–delay or put off. Professor, can I postpone my presentation? I can have it ready by Monday, but I’m not ready now. How many ways can you say “walk”? I don’t know for sure, but I’m thinking that if the prefix “post” is fairly distinct from the root word (that is, it is essentially a compound noun like “housewife”) it’s pronounced pOst (long O), and when it’s fairly well incorporated into another Latin root word, it subsides to “post” (short o) in order that the “meaning” part of the word (the Latin central root of the word) can receive the stress. I’ve read so much Victorian literature that I can see every single one of those now-nonhyphenated words as hyphenated. That’s it!!!!! Oh, it is! I adore teaching English because I get to ponder questions just such as this. Thanks for writing!